Profloor 2 Pack Floor Paint Gloss Finish exceptionally hard wearing antislip floorcoating. 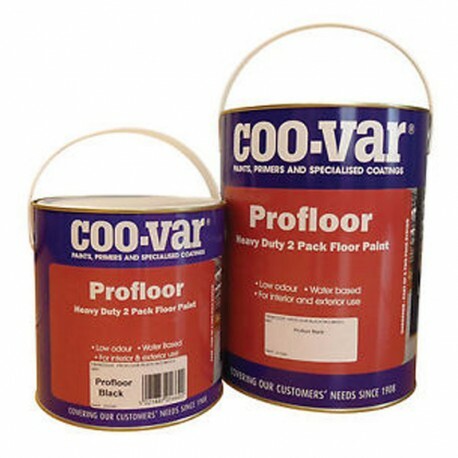 Coo-Var Profloor Paint is a water based two pack epoxy floorcoating. Ideal for use in heavy traffic areas where vehicles such as trucks and vans are to be used either inside or outside. With the anti-slip option Profloor is a heavy duty anti-slip solution. Contains no organic solvents and is low odour. Can be used on top of stable existing paint. Ideal for schools, workshops, commercial and industrial property. Coo-Var Profloor Paint is available in Tile Red, Mid Grey, Yellow, Green, Black and White (other colours can be made to order) in 5 kilo mixed units. One unit is sufficient to cover about 35 square metres with one coat. Whilst one coat may suffice a second is always beneficial and ensures the best performance from the product. Should be diluted with 500 ml of water per 5 kg pack for application.